Dangerous Goods Declaration & Shipping Notes - Buy Directly Online! 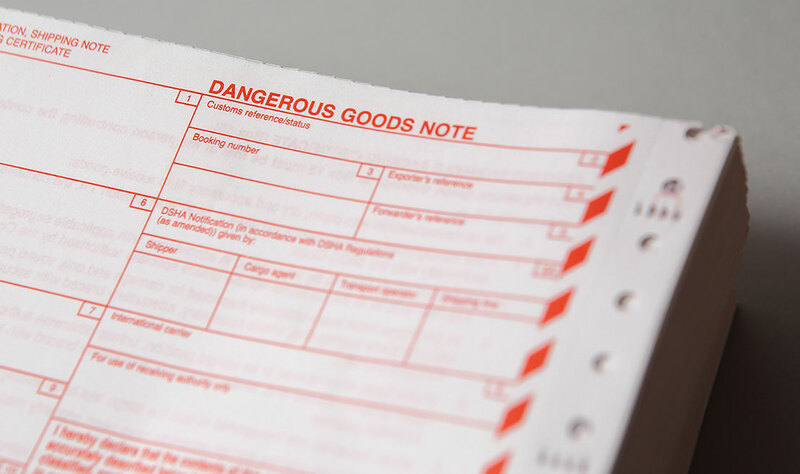 If you’re planning on transporting chemicals or hazardous goods, you’ll need to have the correct shipping notes and dangerous goods declaration in order to be compliant. As a licensed supplier of documentation for use in the transportation of dangerous goods, we stock a full range of Dangerous Goods Declaration, Standard Shipping Notes and IATA Shippers Declaration documents. Our documentation can be supplied as Single Sheets for use in laser printers, or Four Part Tipped carbonated sets for manual completion. We can also supply copies suitable for sprocket fed printers. All of the documentation we supply is suitable to be filled in either by hand or laser printer. We also supply sheets for sprocket-fed printers.